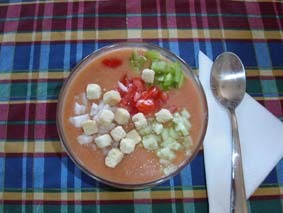 Gazpacho, the Spanish vegetable soup, which origin is from Andalucia in the south of Spain, has become very popular also outside the borders of the country. The soup should be served ice-cold and is a delicacy on a hot summer day. 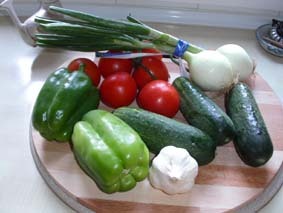 Some of the ingredients for making Gazpacho. 1) Peel and chop the vegetables. 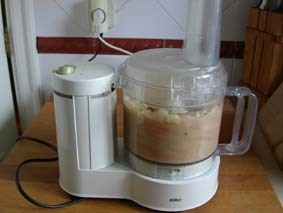 2) Mix half of the vegetables at the time in a blender. I prefer to first mix the vedgetables in a food procesor. 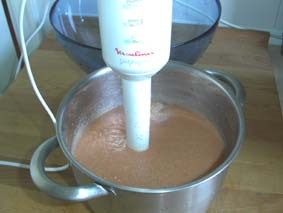 3) Blend on high speed until the mixture is smooth and no pieces remain. 4) Add the rest of the ingredients and mix one more time in the blender. 5) Season with salt and more vinegar if necessary. I finish with a blender util the mixture is smooth. 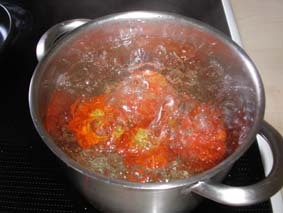 6) Keep the soup refrigerated until served. You can add cubes of ice in the soup bowl before its served. The trimmings are served in small, separate bowls and everybody help oneself to garnish their soup.